Many of you know that my wife spends a good deal of her time studying the ways in which immigrant, refugee, and minority language learners acquire a new language differently than for those who grow up learning it in school. In this post, I am publishing instructions on how to install a piece of software, called DMDX, on a Macintosh computer with the hopes of making it easier for researchers like her to take advantage of this tool without further adding to its already long list of hassles. Peace at SFO – who would’a thunk it? It’s incredibly calm right now, and considering the chaos I left an hour ago – that’s pretty incredible. This weekend I have been attending the Hacking EDU conference at our Automattic booth (we’re one of the primary sponsors). The event bills itself as the largest educational hackathon in the world and more than twelve hundred students attended (or so I was told). It’s been a good weekend but pretty loud and chaotic. Somewhat late in the day I decided that it would make more sense to spend the night at the airport instead of trying to get here in time for my 6:00am flight home. Times like these I really wonder what I must have been thinking when I booked the flight, but it’s all going to work out just fine. I’m the only one in sight except for a few scattered cleaning crews and the only noise is the gentle hum of the air conditioning. Having this peaceful and quiet decompression time wasn’t something I anticipated, but I sure am thankful for it. Hundreds of students form teams to compete for prizes and internships. Those of us who attended the Automattic booth at the hackathon didn’t know what exactly to expect there. The array of highschool and college students, on the other hand, all seemed to have some idea as they strolled in on Friday afternoon carrying a sleeping bag under one arm and a wide-screen monitor in the other. We brought more swag than we usually would, but I think we ran out of most stuff after about an hour or two – those freebies went fast! Unlike most of the other sponsors, we weren’t exactly there to push our products or services on the participants. Lots of people came and asked us, “What are your APIs?” and expected us to have a list. We really just wanted to encourage them all to pursue programming and their creative talents, but a couple other companies brought some hefty prizes: $2,000 for the most creative use of Target’s API; $5,000 for the best app built on top of a database platform online; etc… We sponsored a prize for the app or idea with the greatest social impact. Not homeless; not underprivileged; this is the making of a Silicon Valley tech-startup entrepreneur. For those of us at the booth who didn’t grow up in the Bay Area, we had a mantra for the weekend, “This is sooo Silicon Valley.” (We were referencing both the startup culture of this area and the parody sitcom about it on HBO). Students had a surprisingly varied level of technical background, from those hitting the ground running to those who didn’t realize that Facebook runs on the Internet, but almost everyone had one goal in common: find the next disruptive and revolutionary idea to pitch to the judges; find someone interested enough to fund their idea; chart their own way as their own boss and eschew college – and oh how buzzwords flew 😊. Sadly, for most of them this is but a pipe dream, but a few will probably make it in the end and hopefully they will all go away inspired and energized. Some really incredible people spoke at the event: the founder of the Y-Combinator, a popular seed-funding venture capital program; the founder of the Khan Academy online learning website; our very own Guillermo Rouch (who just left Automattic a couple weeks ago and will probably start some other great new thing any day now); and several leaders and pioneers in the technology world. One of the side rooms where the “magic” (or attempted sleep) was happening. The students are spending the whole weekend at the event center. I’m pretty sure most of them will have gone seventy-two hours without stepping outside or seeing the sun before they finish up tomorrow. The stocks of Redbull and Hint water, the stacks of paper towels and Fruit Loops, the emergency boxes full of toothpaste and mouthwash were staggering and hilarious at the same time. It has just been such an incredible experience and I know I would have loved to have participated when I was still in highschool. Although we left just a single Automattician to man our booth, the kids are still grinding away (between playing bubble-ball-soccer and taking advantage of the biggest LAN party they will likely ever experience). Their teams and projects have to be officially submitted in about ten minutes from now, I think, but they can continue to program or finish the details before demonstrations and judging tomorrow. As usual, I chose adventure over luxury for my travels here to San Mateo and stayed at a “HackShack” hackers hostel. Actually, it’s just the home of a couple guys pushing along in the startup world trying to make the best-new-thing and they have opened up their rooms to errant hackers. Last night I had the great opportunity to work with them and chat for a while before going to bed and I had a great time learning about the problems they are trying to solve and the innovative ways they are accomplishing them. It’s a shame to come all this way and hurry home, but I had plans long before this weekend to be with Mandi tomorrow. I would have liked to have hung out a bit more with my new startup friends at the Hack Shack and to have taken the train up to San Francisco to visit a few teammates, but honestly the Grand Meetup was exhausting and relentless – just as this weekend has been too. I had a lovely time getting to know a few of my coworkers better and now have the awesome experience of being the only one in a busy airport. Have a nice rest yourself; and good night! While reading some more research papers on point-spread-function estimation, I was reminded that the scope of my pet-project is probably enough to entail an entire master’s project. No, it’s not a racy post. It’s a play on words some funny programmer chose for the name of this StarExtractor. Actually, it’s called sextractor without the space, but I digress. It may not look that impressive now, but it carries massive implications. 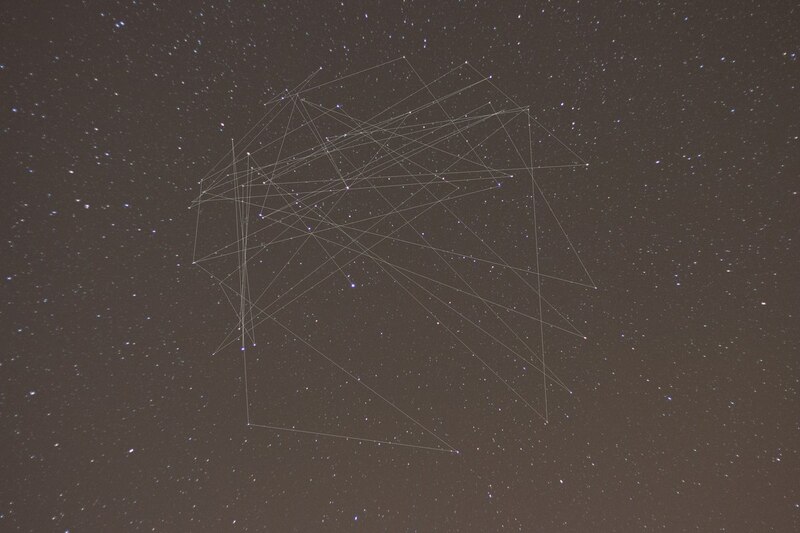 This represents a big step forward in my pursuit of a clear shot of the night sky. The process that I have worked out requires automatic alignment of each shot from my nocturnal photo-shoots, but the algorithms I have been using keep failing. My suspicion is that they fail because they are looking for features and the stars are just a bunch of points – featureless. This, however, changes everything. This is a line drawn among the fifty brightest stars in the central area of the image and I was able to produce it automatically with the help of sextractor, which identified and classified the stars in the image. These lines will hopefully be enough of a set of features for the other algorithms to match. Do we want more shiny things or do we want things that won’t break?